Fast-search.tk – How to remove? Fast-search.tk is a dubious search engine and a browser hijacker. It can enter your computer without your knowledge via software bundles and will make unwanted changes to your browser. If you’ve encountered fast-search.tk, you might think it’s a computer virus, but it’s not. It will not harm your computer but it will behave in a very annoying way. You will be redirected to sponsored websites so that those websites can earn money. Obviously, fast-search.tk is of no use to you. It can even expose you to dangerous websites and you could end with malware on your computer. Which is why we strongly suggest you remove fast-search.tk. Why do you need to delete fast-search.tk? If your browser has been hijacked, you must have recently installed free software and used Default settings. You probably already know this but freeware, more often than not, has certain items attached to it. Such as a browser hijacker or adware. They’re not computer viruses, but they’re annoying all the same. If you use Default settings, you give all added items the permission to install. Which is why you need to use Advanced or Custom settings. They will allow you to deselect all added items and you can proceed with the freeware installation. A browser hijacker exists to generate traffic for certain websites. That’s how those websites earn money. 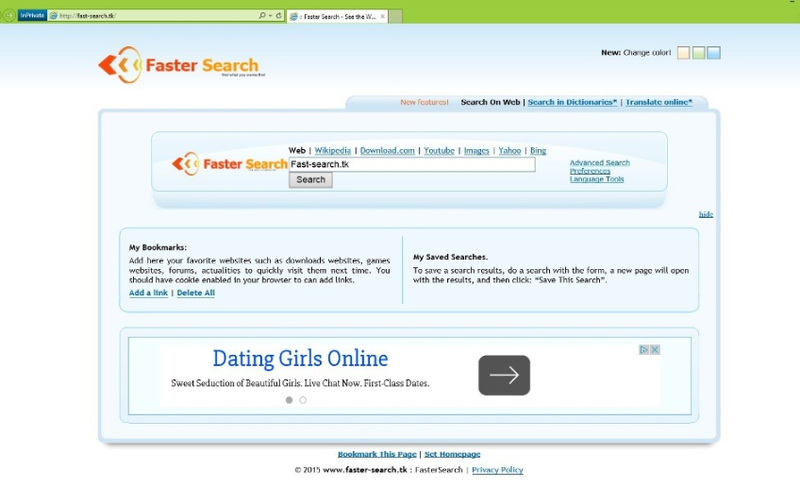 In order to redirect you, fast-search.tk needs to alter certain browser’s settings. When you open your browser, be it Internet Explorer, Mozilla Firefox or Google Chrome, you will notice that fast-search.tk has set its domain as your homepage, new tabs and search engine. You will be prevented from changing the settings back unless you first remove fast-search.tk from your computer. The search engine tries to fool you into thinking the results are generated by Yahoo but in reality it modifies those results and inserts loads of sponsored content. You could be taken to totally unrelated websites. This can become annoying very quickly. It could also insert ads and pop-ups into the browser and use them to redirect you. The thing about redirects is that they can also lead you to unsafe domains and you could end up with a malicious computer infection. We strongly suggest you uninstall fast-search.tk from your computer and look into alternative search engines. You have two ways to delete fast-search.tk, automatic and manual. Anti-malware software will easily uninstall fast-search.tk and leave no traces behind. However, if you do not have such a program on your computer, you can erase fast-search.tk by hand. You will need to find and then eliminate fast-search.tk yourself. Some users struggle with that so we have prepared a guide to help you.